PunkBuster used to be the standard anti-cheat software used in older Call of Duty titles but now that Activision has switched their games to the Steam platform they have moved to a combination of anti-cheat measures through the Valve Anti-Cheat System (VAC) and Activision developer’s own in house anti-cheat technologies. As of 2013/2014 Even Balance has officially dropped PunkBuster support for older Call of Duty titles. My assumption is they had contracts with Activision to support these Call of Duty games for periods of time and when those contracts expired Activision made the decision to not renew those contracts because of the latest games being released. 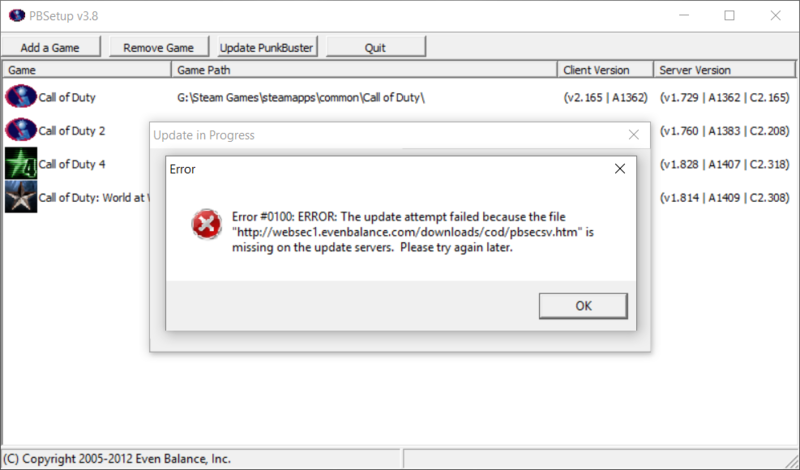 There are still a lot of servers running PunkBuster in the older Call of Duty titles and if you can’t get your PunkBuster files updated on the client side you will most likely run into issues when joining or trying to play on PunkBuster enabled servers. 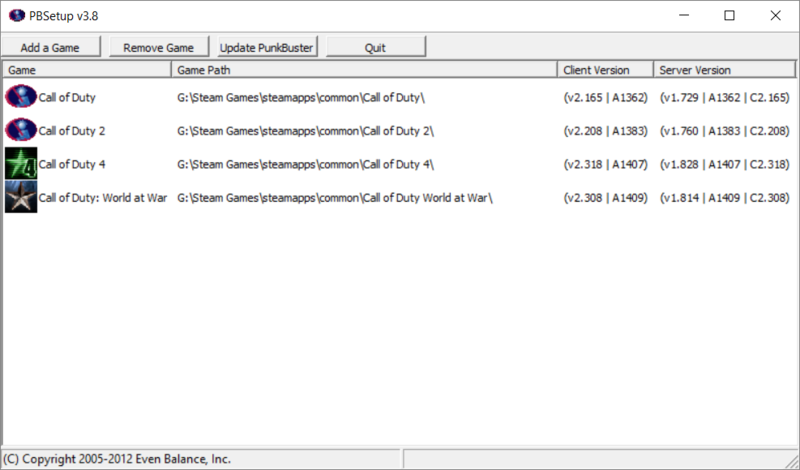 Even Balance does offer a standalone update tool called PBSETUP which you can download and run to manually add the Call of Duty games you have installed and force the update of local PunkBuster files but with the latest versions of PBSETUP released the older Call of Duty titles have been removed from the “supported games list”. 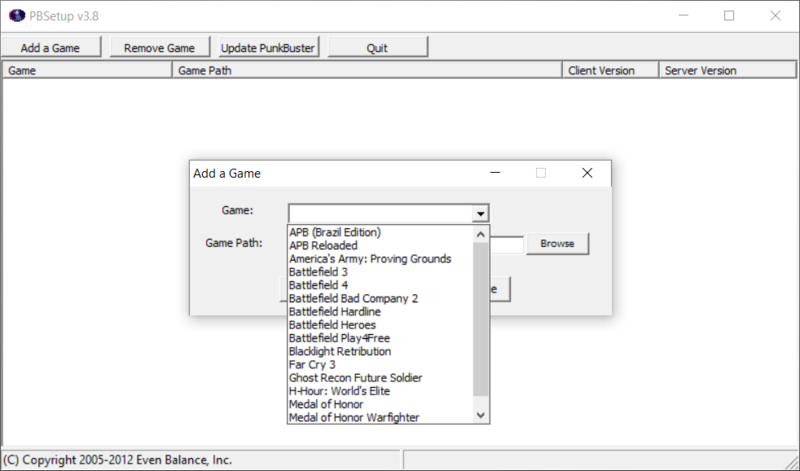 There is some information out there that instructs you how to edit that “supported games list” which allows you to add the older Call of Duty titles back into PBSETUP – however now it seems Even Balance has also removed all of the Call of Duty download files from their servers so when you get the games added to PBSETUP and attempt to check for updates it just fails anyway. This brings us to one solution; user-to-user sharing of the latest downloaded PunkBuster files because there is no other way to get them at this point. You can download the necessary files below and simply copy the files from the download into the “pb” folder located within the respective Call of Duty game installation directory overwriting any files that are currently there. If you are unsure of your Call of Duty game installation directory below are some common paths for each game. I recently did some hardware upgrades on my gaming system and did a fresh install of Windows 10 and upon trying to get these older Call of Duty games up and running correctly again I found myself spending quite a bit of time trying to figure out what was going on and how to get around these PunkBuster issues. With the many places I had to look and find things I thought it would be best to just put some information here collectively to help individuals going through this in the future. Thanks go to the following places for helping me gather information on this topic.